Many organs arise from simple sheets and tubes of cells. During development, these sheets bend and deform into the more complex final shape of the organ. This can be seen, for example, in the hindgut of fruit flies (Drosophila), which is an organ equivalent to our intestines. The Drosophila embryonic hindgut first forms as a bilaterally symmetric structure and then rotates 90°counterclockwise as viewed from the posterior to become asymmetric. Before the hindgut rotation, cells in the hindgut tilt leftward and are asymmetric. This structure cannot be superimposed on its mirror image, so this asymmetric structure is called cell chirality. As cell chirality disappears after the rotation, it was thought that cell chirality was related to this hindgut rotation. 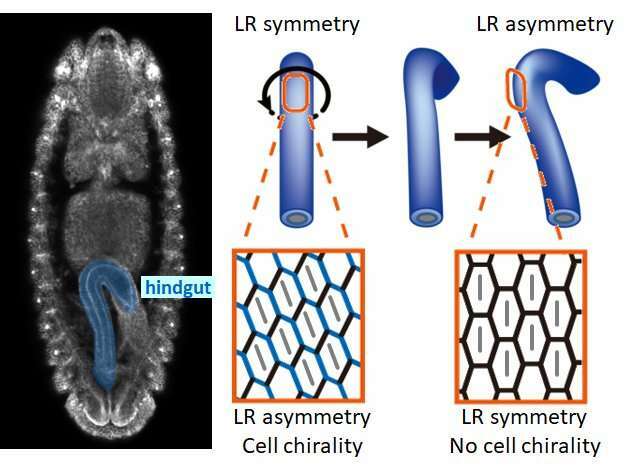 Previous studies, however, were performed using fixed samples, so the cellular dynamic mechanism by which cellular chirality was converted into an LR asymmetric organ remained unknown. 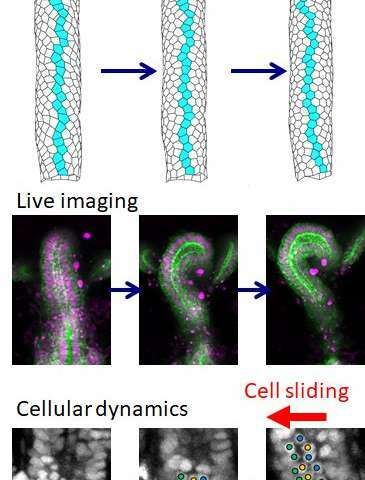 Researchers led by Kenji Matsuno at Osaka University used live imaging of the Drosophila embryonic hindgut and computer simulations to clarify that a novel cellular behavior called "cell sliding" was important for the LR asymmetric morphogenesis of the organ. Their research results were published in eLife. Lead Author Mikiko Inaki said, "We found that when the hindgut rotated, the cells changed their position relative to the cells located below them (posterior in the embryo) by sliding leftward. We named this movement 'cell sliding.' In an inversion mutant showing inverted cell chirality and hindgut rotation, cell sliding occurred in the opposite direction to that found in the wild-type. Thus, we confirmed that cell sliding was important for the LR asymmetric rotation of the hindgut." This group's achievements will deepen an understanding of the mechanism behind the morphogenesis of organs that have tubular structures, such as the digestive tracts and heart. It is also anticipated that their research results will be applied to the regeneration of organs in the future.